You may wonder where that bumblebee goes when she's finished checking out your flowers. Perhaps you questioned where that yellow jacket flies after harassing you and your soda. Either one may call a nest in the ground home. As well, a variety of ground-nesting bees keep their homes on the down low. There's a variety of ground-nesting bees that choose to nest in their own holes in the ground. They vary in size -- from 1/2 inch to 3/4 inch -- as well as color, including metallic red, blue, green and copper. 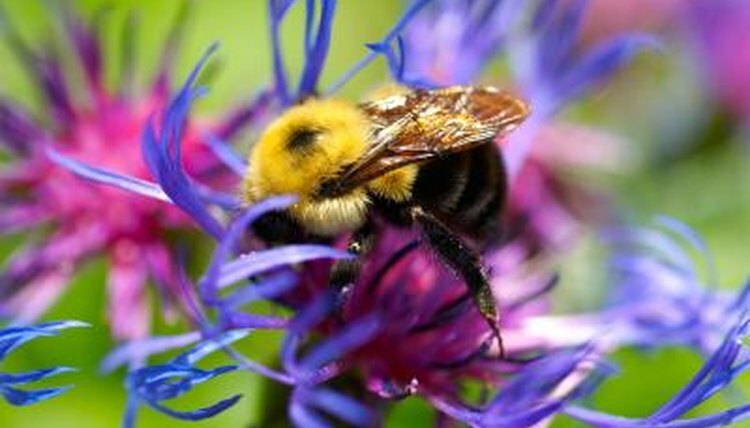 Among the groups of ground-nesting bees are sweat bees, mason bees, digger bees and leafcutter bees. Though they're solitary and live the single life, these types of bees usually nest close to each other. Generally, ground-nesting bees aren't interested in stinging you. You're more likely to see them during spring when it's nest-building time. Ground-nesting bees don't really build hives, but instead, live in underground tunnels. Female bees are busy in the evening hours excavating nesting tubes. The telltale sign of a ground-nesting bee's nest is a small mound of soil around the nest's opening. These bees generally prefer nesting in areas with morning sun exposure and well-drained soils containing little organic material. These guys likely won't disrupt your routine -- it's safe to mow -- however if there are more of these bees around than you're comfortable with, steer clear of the area for a month or so until nesting season is over and you'll likely avoid them. Bumblebees, the furry, fat bees often seen buzzing around your flowers, also will take to the ground to build their nests. These bees don't excavate tunnels, but instead take advantage of existing openings to build wax-celled hives that are fairly simple in nature. They're opportunistic in their nesting, known to build nests in piles of dry leaves, building spaces, under concrete slabs or even insulation. Bumblebees aren't aggressive, usually more interested in checking out your flowers, however, if you get too close to a nest, you're apt to feel it. Like bumblebees, yellow jackets consider the ground a potential nesting site. Attics and eaves, trees and shrubs, rodent burrows -- all are great alternatives for their papery hives. Yellow jackets make their hives from a pulp of chewed up wood fiber and saliva, building a nest of rounded combs layered in tiers. Several layers of pulp cover the tiers. These guys are more aggressive than bumblebees, particularly if there's food or drink nearby. Think long and hard before you decide to get rid of the bee's nest you've come across. Bees are ecologically important, playing a vital role in pollinating crops and other plants. If ground-nesting bees are bothering you, try keeping the area damp or sprinkling water in the nests; these bees tend to avoid damp areas. Sevin dust also is effective in deterring ground-nesting bees, yellow jackets and bumblebees. The Bee Hunter: What Type of Bee Problem Do You Have?